Delfest, a music festival that finds just the right balance between roots and branches, takes place every Memorial Day weekend at the Allegany County Fairgrounds in the mountains of western Maryland. The old racetrack sits on the north side of the Potomac River, and directly across the river rise the vertical cliffs of West Virginia. Upon those cliffs, when the sun goes down, a projector casts a light-and-shadow portrait, several hundred feet high, of the festival’s namesake, Del McCoury. In that cliffside portrayal, McCoury has his head tilted back and his mouth open in a hearty laugh. That’s the way most people think of the musician, because he breaks into an infectious chuckle every few minutes—whether he’s on stage or off. And it’s his instinctive amusement at all the world’s quibbles and foibles that enables this festival to work as well as it does. McCoury is a bluegrass giant, the field’s most towering figure in this century, but it would be a mistake to describe Delfest as a bluegrass festival. It’s better described as a string-band festival, an occasion for exploring all the possible sounds that can be made by a particular set of instruments: violin, mandolin, banjo, dobro, acoustic guitar and upright bass. Those instruments can’t be limited to bluegrass; after all, they were making country music long before Bill Monroe invented bluegrass in the early ‘40s, and they’re now used in ways unimagined when Monroe died in 1996. Watch The Del McCoury Band live at Paste Studio on June 8. This year’s festival, the 11th annual, showcased those instruments as used by classic-bluegrass acts such as the Del McCoury Band and Ricky Skaggs & Kentucky Thunder. But it also made room for new-grass acts such as Jerry Douglas, Sam Bush and Del’s sons, the Travelin’ McCourys, for old-time acts such as Old Crow Medicine Show and Dustbowl Revival, for jam-grass acts such as Greensky Bluegrass and the Infamous Stringdusters, for singer-songwriter acts such as Richard Thompson and Rhiannon Giddens, and for chamber-grass acts such as David Grisman and the Kruger Brothers. There was diversity, but it was threaded together by the sound of music made by hollow wooden boxes. Del was lead singer and rhythm guitarist for Bill Monroe in 1963, and he can still do the high-lonesome sound of foundational bluegrass as well as anyone has ever done. But he’s also been willing to record songs written by Tom Petty, John Sebastian, Steve Earle and Richard Thompson, adapting those roots-rock numbers to the Monroe approach. The Del McCoury Band, featuring Ronnie on mandolin, his brother Rob on banjo, Jason Carter on fiddle and Alan Bertram on upright bass, played every night of the four-day festival. 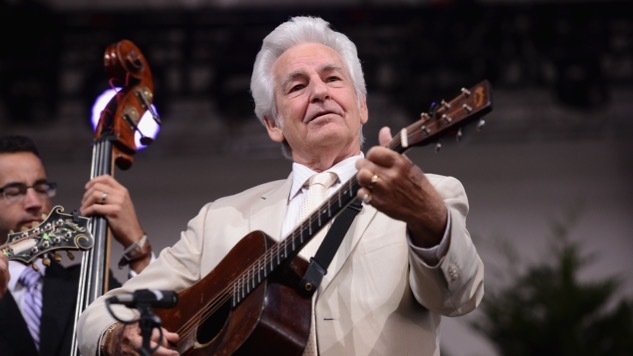 On Friday, they showcased songs from their new album, Del McCoury Still Sings Bluegrass, released that very day, half a century after Del’s 1968 debut album, Del McCoury Sings Bluegrass. Del displayed his remarkable high tenor, steely in its strength and yet true in its feeling, on the album’s remake of Ernest Tubb’s “Letters Have No Arms.” Written correspondence, he sang, is nice, but it’s no substitute for physical contact—a message as true for us emailers and texters as it was for Tubb’s snail-mail fans. As ably as it adapted Tubb’s honky-tonk classic, the McCoury Band also handled Shawn Camp’s comic rockabilly romp, “Hot Wired.” For that song, Ronnie’s son Heaven McCoury, the electric guitarist for Nashville’s funk band Broomestix, joined the family gathering with some blues-rock soloing. With his erect posture, shiny gray suit and combed-back silver hair, Del looks like he stepped out of the 19th century. But he’s surprisingly open to almost any kind of roots music, especially if it involves the core bluegrass instruments. It’s that combination of an unarguable connection to the past combined with an openness to the new that gives Delfest its distinctive character. As his two sons have grown older, their musical tastes have infected their father. They made the connections with Earle and Thompson and brought those songs into the band. As Del, now 79, has slowed down, the rest of the band has taken to working as the Travelin’ McCourys, with Ricky Skaggs’ former guitarist Cody Kilby handling the guitar duties. Last year, Ronnie reported, they did about 75 dates with their dad and 75 dates on their own. And last Friday, they too released a new album, The Travelin’ McCourys, their debut under that name. With two songs by the Grateful Dead plus songs from Nick Lowe and Buffalo Springfield, it stretches the possibilities of string-band music even further. Another old-time band, Dustbowl Revival, has taken the fusion between the Del McCoury Band and the Preservation Hall Jazz Band and pushed it even further. Combining the fiddle, mandolin, acoustic guitar and upright bass of the McCourys and the trumpet, trombone and gospel-soul singing of Preservation Hall, Dustbowl has demonstrated just how much old-time country and traditional New Orleans jazz have in common. Playing on the only indoor stage on a rainy Sunday afternoon, Dustbowl had it all: dazzling soloists in fiddler Connor Vance and trombonist Ulf Bjorlin, a savvy songwriter in Zach Lupetin, and a roof-rattling singer in Liz Beebe. When the band climaxed the show with their signature party tune, “Lampshade On,’ a handful of fans in the crowd were already wearing lampshades atop their heads. While Old Crow, Dustbowl and the Wood Brothers were able to combine a stirring sound with sharply defined songwriting, a lot of the younger bands at Delfest had the sound but not the songs. Jam-grass too often suffers from the same problem as jam-rock: strong playing and weak material. The Birds of Chicago, Twisted Pine, Mandolin Orange, Greensky Bluegrass, Horseshoes & Hand Grenades and Fruition had some talented pickers and a lot of energy, but the only numbers one could remember were the covers. A different kind of songwriting was on display when the newly formed Dawg Trio performed Friday afternoon. Playing only their second show as a band, mandolinist David Grisman, his son and bassist Sam Grisman and guitarist/banjoist Danny Barnes locked in so tightly that they could play the older Grisman’s tricky melodies and counter-melodies in perfect mesh, even when they began improvising variations on the themes. Much has been written about Grisman’s ability to cross the border between bluegrass and jazz, but seldom is it acknowledged how much he owes to European chamber music based on Continental folk music. But the contours of his themes and the way they fit together betray that debt. Call it chamber-grass. The same term can be applied to the Kruger Brothers, a trio formed in Zurich and now based in the North Carolina hills. Banjoist Jens Kruger is a Grisman-like composer, and he showcased two movements from his “Appalachian Concerto,” an ambitious piece whose mountain-music flavors and classical structures justify both halves of its title. Saturday evening’s shows were delayed by a downpour and then dampened by a steady drizzle that fed the huge puddles growing around the audience’s feet. Nonetheless, Del McCoury convened the first annual session of the “Bluegrass Congress,” and one by one he invited such luminaries as David Grisman, Ricky Skaggs, Sam Bush, Jerry Douglas, Bryan Sutton and Stuart Duncan to sit in with the McCoury Band and share the vocal mic with himself. No one relied on gerrymandering to get into this legislature; this was a meritocracy. There was more rain Sunday afternoon, but the precipitation stopped for the final sets by the McCoury Band and Old Crow. But a mountain mist stole in and threaded itself along the Potomac. From the stage, Del could look down the river valley to the west, watch the setting sun tint the fog pink between the green slopes and hear a train rolling by. It was the perfect set-up for the final run of songs, a trip through American music via a weather lament (“Rain and Snow”), a chain-gang song (“Blackjack County Chains”), a murder ballad (“Eli Renfro”), a country classic (“Crying Heart Blues”), a gospel quartet (“Get Down on Your Knees and Pray”) and a railroad song (“Train Wreck of Emotion”). These were the right songs sung by the right man at the right moment.